Hey Everyone! My name is Lauren, and I’m soo thrilled to be guest posting on Pretty Providence today! I’m visiting from the foodie blog Tastes Better From Scratch, where I share our favorite recipes and cooking successes! I also happen to be lucky enough to be one of Jessica’s sister-in-laws and good friends. The ‘good friends’ part of our sequence came before the ‘sister-in-laws’, as my twin and I met Jessica in college and became instant besties our Freshman year. We like to think we convinced her to date our Brother (but he was totally into her without our persuading) and she’s been a big part of our life and family ever since! 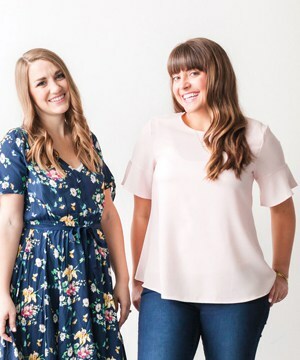 As anyone knows who follows the Pretty Providence blog knows, she is beautiful, talented, thrifty, and basically totally amazing! Today I’m excited to help kick-start Fall and the impending Halloween season with one of my favorite treats–Caramel Apples! 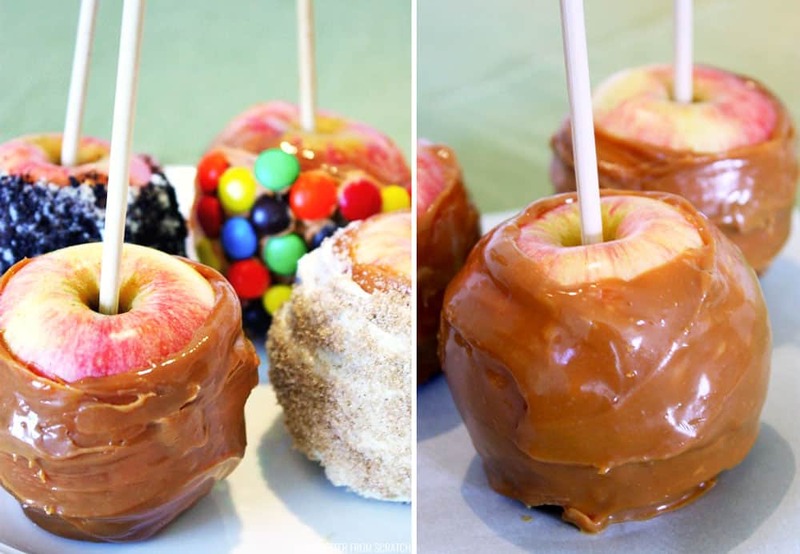 And not just any caramel apples. 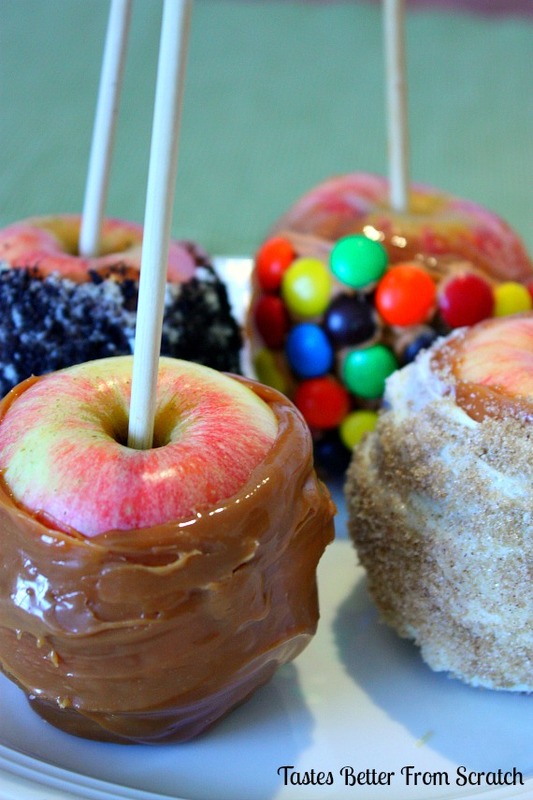 We’re talking gourmet, apple pie, oreo, and m&m caramel apples! They are really simple to make, delicious, and more importantly, perfectly budget friendly! Wash apples, remove stems, and thoroughly dry the apples. Refrigerate apples overnight or a few hours before using so they are nice and cold. Secure sticks into the tops of the apples. Place a piece of parchment paper on a cookie sheet. Place unwrapped caramel and milk in a medium size saucepan over medium-low heat. Stir continuously until the caramels are melted. 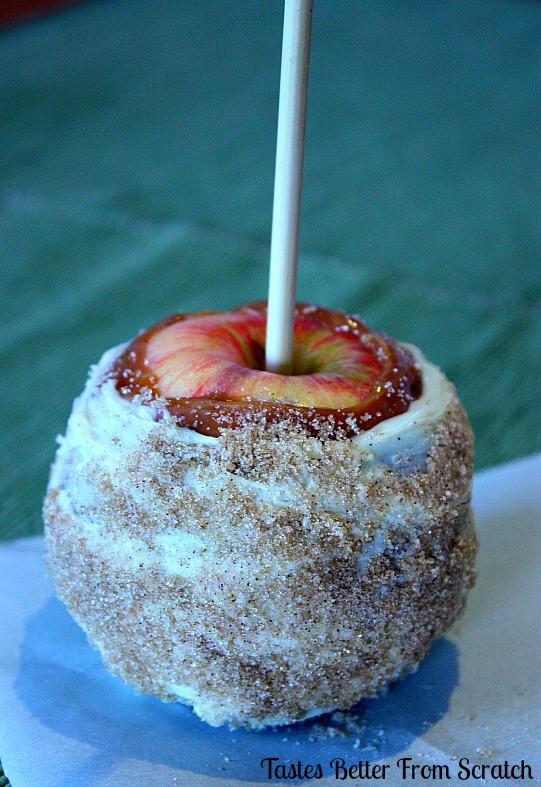 Holding an apple by the stick, dip it into the caramel, continuously turning it until it is coated. (I’ve found it helpful to use a spoon to help smooth the caramel over the apple. 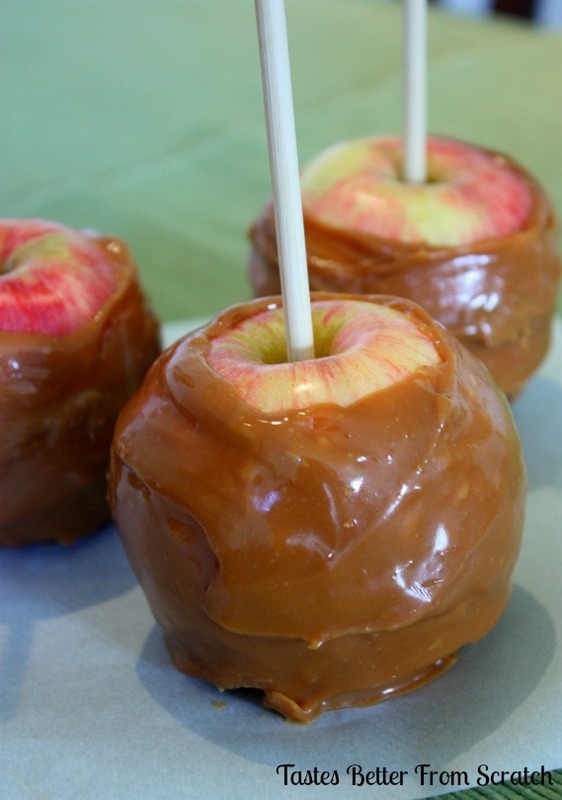 Allow any excess caramel from the bottom of the apple to drip off. Place on cookie sheet. Repeat with remaining apples. Place apples immediately in the refrigerator, except for the apple you will be placing M&M’s on. 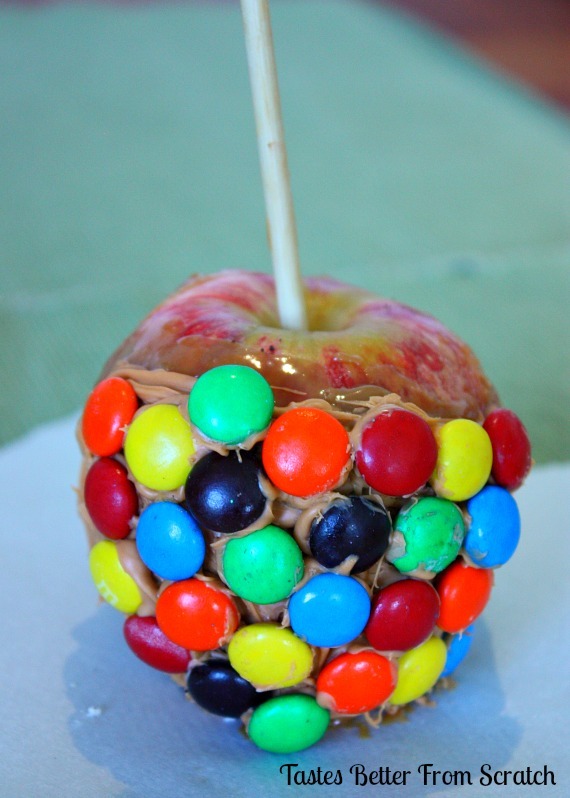 Immediately stick M&M’s into the soft caramel surrounding the apple. Refrigerate. In a small bowl combine brown sugar and cinnamon. In another small, microwavable bowl, place the white chocolate. Microwave chocolate at 20 second intervals, stirring between intervals, until it is melted and smooth. Dip caramel apple in the melted chocolate. Use a spoon to help you cover the apple. Immediately sprinkle brown sugar and cinnamon mixture on the chocolate. Place the white chocolate in a microwave safe bowl. Microwave at 20 second intervals, stirring between intervals, until it is melted and smooth. 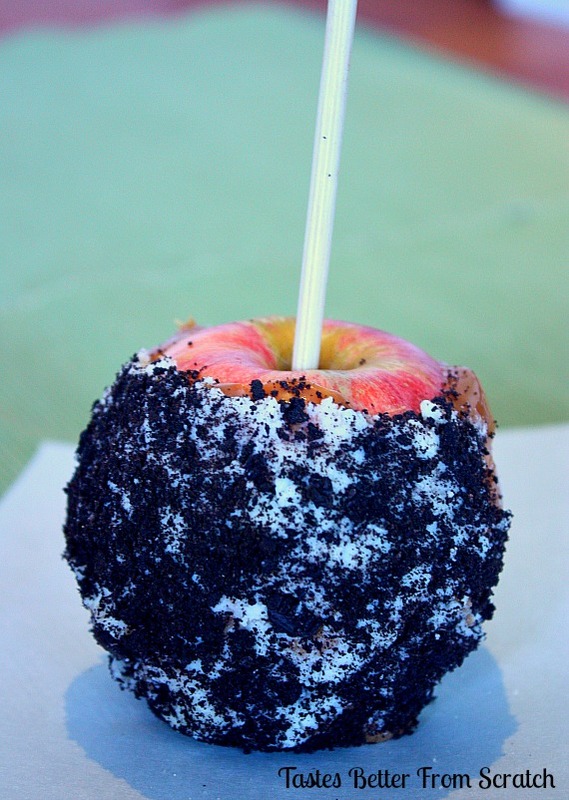 Dip caramel apple in the melted chocolate. Use a spoon to help you cover the apple. Immediately sprinkle crushed Oreos all over the chocolate. Refrigerate. To slow the ripening process and keep your apples crisp, store them in the fridge in a plastic bag. Hope you’ll love this recipe and will stop by Tastes Better From Scratch for some other fun fall recipes like Pumpkin Cinnamon Rolls with Caramel Cream Cheese Frosting, Cornbread Waffles with Chili or Apple Pie Cheesecake Bars! Oh. My. Goodness. Is anyone else loading up their kids right now to run to the store and buy supplies? Because, I AM. Thanks again Lauren for guest posting! I love you pretty mama.